Docubank is one of the simplest and yet most robust application to safely store your critical documents and retrieve them at your convenience. Scanning function enables user to scan any new document from attached scanner. The application has necessary plug in to identify the scanner. If you are scanning for the first time, the browser may ask you to download a small plug-in to enable it to identify the scanner(s) attached. Please follow the given instruction and you may find it easy to start scanning the documents directly. Identify Papers - Others Investment - Gov. Sec. Tagging Function enables user to add additional information on the stored documents / files. All uploaded files are also pre-categorised into easily identifiable folders. In addition to this, DocuBank also enables user to add extra information to every document to make it easier to track and search document later. This activity is done in the Tagging Section. Along with tagging, DocuBank also enables users to Group individual files together ( similar to creating folders) so that all these documents can be viewed together at the same location. This enables agreements and future amendments can be stored together in the same location. There is a separate File Manager as part of Tagging function which can be used to manage files, including Deleting or Moving the file from One category to another. Retrieval Function enables user to search and retrieve the required document. Post retrieval the user has the option of either printing the document or emailing it for further use. 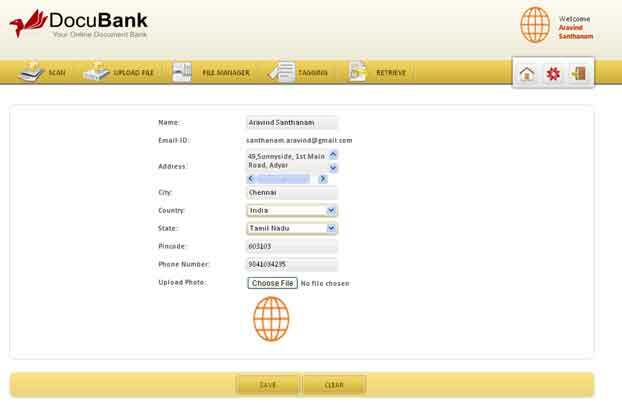 DocuBank has an inbuilt scanning functionality. It can work with any of the Twain Enabled Scanners to directly upload the document from the scanning device. Fig 1.b Screenshot of how to scan page in an application. You have to first mention the category / document type you want the scanned document to be stored-in. You can adjust the image resolution / pixel type / source prior to scanning and post scanning, you can edit the image by cropping, rotating or moving prior to storing the document. The application duplicates as a full fledged scanner in all its functionalities. You can also upload multiple documents at any time. 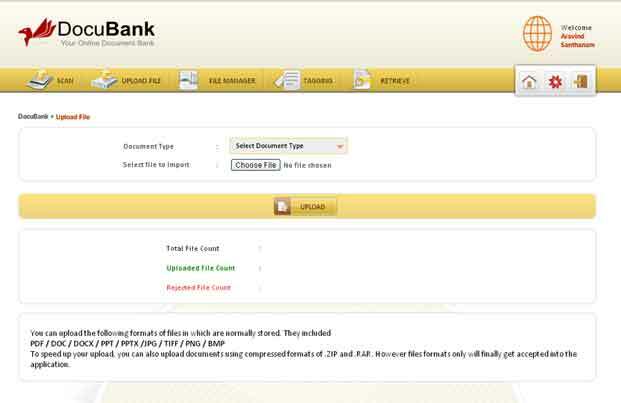 One can also upload pre-scanned documents or e-files in other formats into DocuBank account. DocuBank allows you to store PDF / DOC / DOCX/ PPT / PPTX besides all image based document formats viz. JPG/TIFF/PNG. The same files can also be clubbed together in compressed formats for uploading. The application accepts files in ZIP or RAR formats of Compressed files. Fig 1.c Screenshot of how to upload page in an application. The application will automatically reject any file that does not conform to the above formats. Also there are file size restrictions in place. The application allows for file size upto 2.50MB per file to be uploaded. Files will be rejected if it does not conform to the size limits as well. DocuBank has an Inbuilt File Manager which functions very similar to any regular File Manager that you will find on your own computer. The files can be grouped together, moved from one document type to another. Unwanted files/ documents can be deleted here as well. Fig 1.d Screenshot of how to manage files page in an application. The files are chosen based on Document Type. The application displays all the documents in that category in easy-to-view Thumbnail format. If documents are already grouped, the name of the group will be mentioned in the “maroon color” text below the image. To perform any activity (grouping or deleting or moving to different category), tick the boxes under the thumbnail image and then press the required activity button. Please note that Grouped items cannot be grouped into another group unless you ungroup them first. CAUTION : Documents once deleted cannot be restored. They are permanently deleted from the account. Hence it is necessary to be careful when using the delete function as it may destroy your critical document stored for some other purpose. 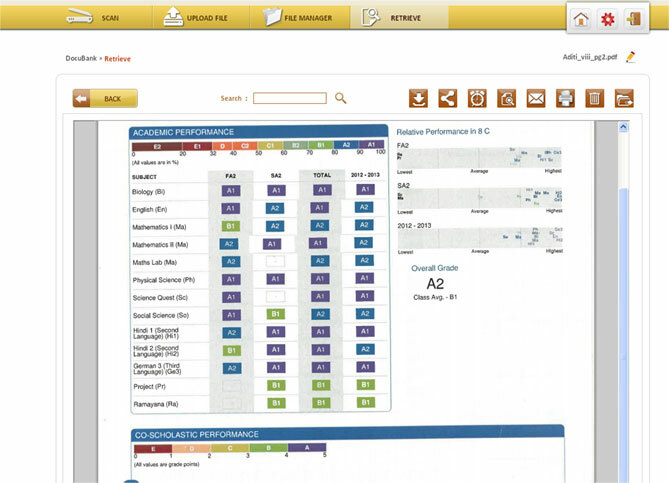 To help with better organizing of the documents, DocuBank has inbuilt templates for various documents. 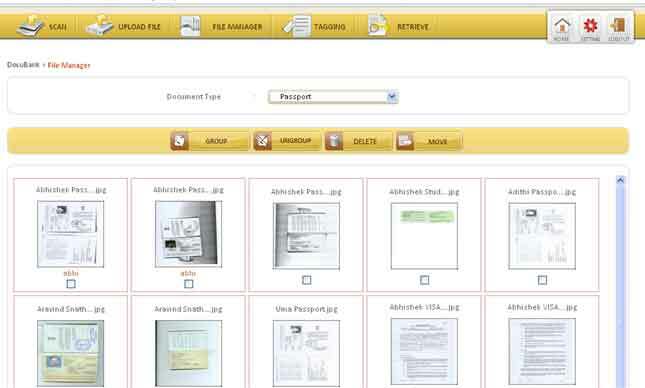 For Personal Documents, there are 5 different types of templates, each having 5-7 fields each which can be used to track various important data related to the stored document. Each of the templates are related to the type of document and aims at capturing relevant information that would be useful in tracing the document faster at any point of time. Please note that tagging is not compulsory. However, we do recommend tagging if you have lots of data available and want to track it in an organized manner. CAUTION : If a document is moved from one Category to another, the Tagging data is automatically lost and has to be keyed in afresh. Searching and reaching to your desired document cannot be easier. While at any point of time, the entire database will be available on the left side for display, data can be shortlisted initially by Selecting the appropriate Document Type. If not sure, use the advanced search feature by typing in the key words . The search will display all the Files containing any tagged data having these key words including the file name or the group name itself. Fig 1.f Screenshot of how to retrieve files page in an application. All group documents can be navigated by simply pressing left or right button on the top right portion of the image. Image can also be enlarged to get a proper view by using the enlarger button on the top right section of the image. Just pressing EMAIL will take you to the next page wherein you can add your personal text and the details of the person you are sending the mail to. 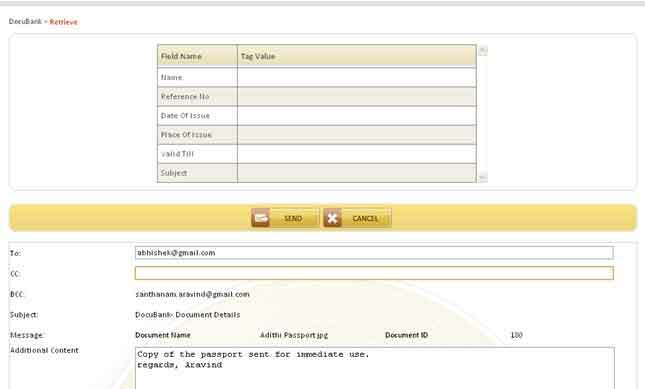 The mail alongwith document attachment will automatically be sent to the desired mail address instantly. One of the biggest USPs of DocuBank is the ability to upload your critical documents using your mail itself. No need to open the application to drop your documents into. All you have to do is send the document as an attachment to docubank@innovasphere.in, The only information you need to add is the Document Type which you have to mention clearly in the Subject Line. On successful upload you will get a mail confirmation from the application stating that your document has been successfully uploaded into respective folder for your future use. We value your critical documents. To help you protect the same, we ensure that your account is virtually hidden from everyone, including us. Password for your accounts are set by you only. Anytime you forget password, new request will come to your mail id using which you can reset your password again. Password can also be changed while you are working in your application. Just press the Change Password under SETTINGS button on the top right navibar area which will take you to the above screen. Your password has to be of a minimum length of 5. While restrictions are not there, we recommend your password having a mix of alpha numeric characters. This is for your own additional safety. You can change your profile at any point of time. Only parameter that remains unchanged is your MAIL ID which is linked to your account. You can also append photograph to make the site more personalized. Just upload any image / photograph in the profile section and the same is reflected in all pages while you are working in the application. Fig 2.c Screenshot of how to add photo/change profile page.